It can be very useful to look a summary statistics about rowing workouts. 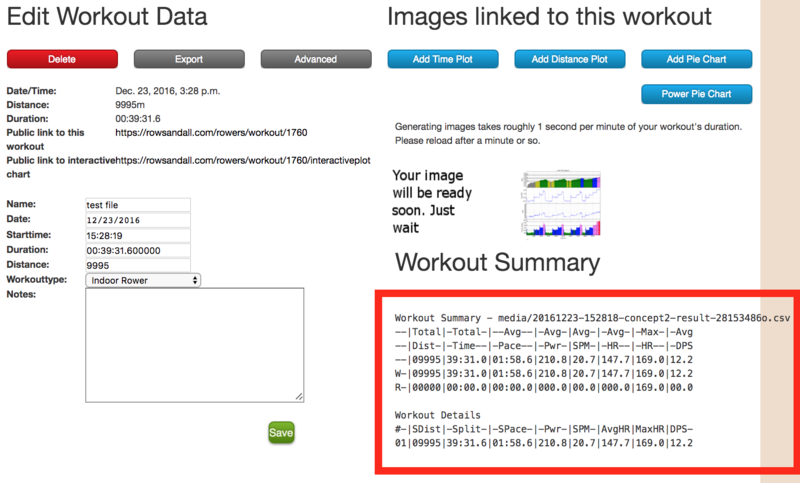 On the workout edit page, down in lower right corner, you can see the workout summary. This area is text, so you can highlight and copy the text into other places. For example, you can plug it into a blog post, like this. The fields are pretty self-explanatory. Avg DPS – The average distance per stroke. Down below the total summary, you can see it repeated with curious SDist, SPace type descriptions. This section is for “Splits”. Splits are just sections of the workout. The definition of the splits can come from the data that you uploaded and it can be redefined by you using the Interval Editor on rowsandall. Let’s look more closely at this session. As you could see in the summary, it’s a 10K row. Note that the summary shows it as 9995 meters. 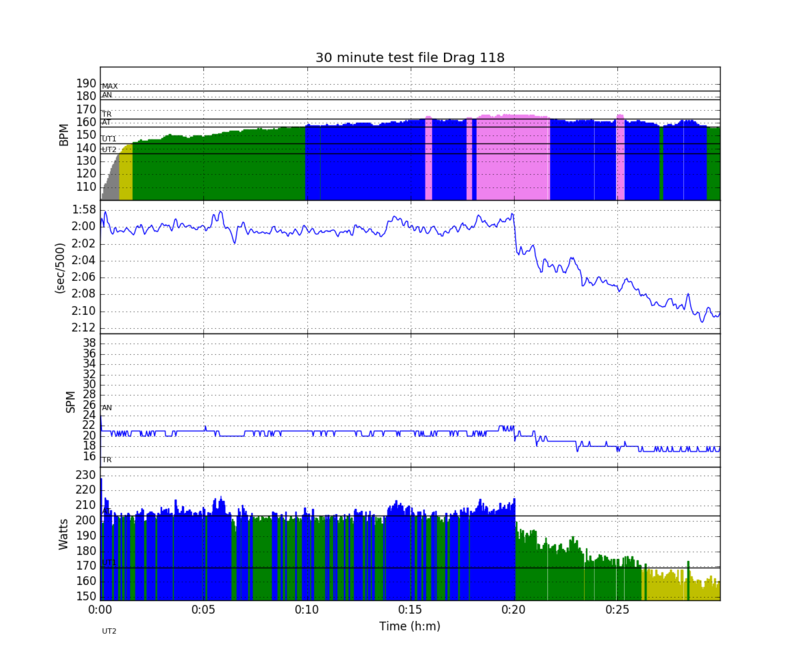 That is just a by product of the fact that all the rowing data is logged by stroke, and the last stroke was 5 meters before the distance ran out. Here’s the summary distance chart from rowsandall. You can see that this work had 4 sections, each of them was 2500 long. 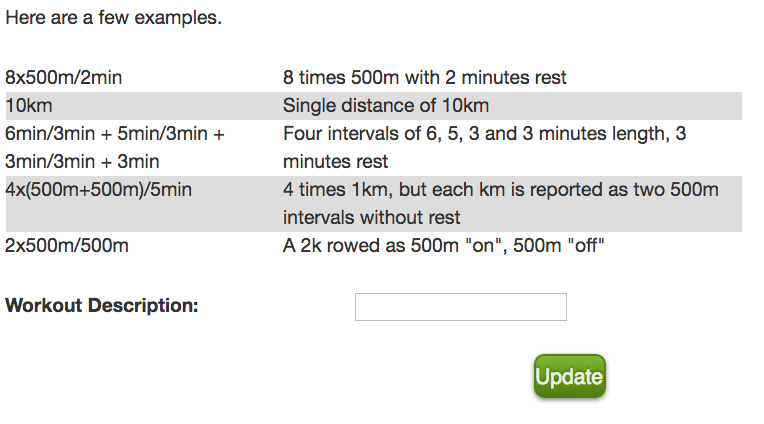 You can use the interval editor to look at summary statistics for each of the four sections. First, where is the interval editor. It’s an advanced feature, so you get to it by clicking the Advanced button. There is a lot going on here, so let’s take it in sections. The graph in the upper right corner is there to help you see where you want to define your intervals. Using the controls over along the right edge, you can pan and zoom on the data. 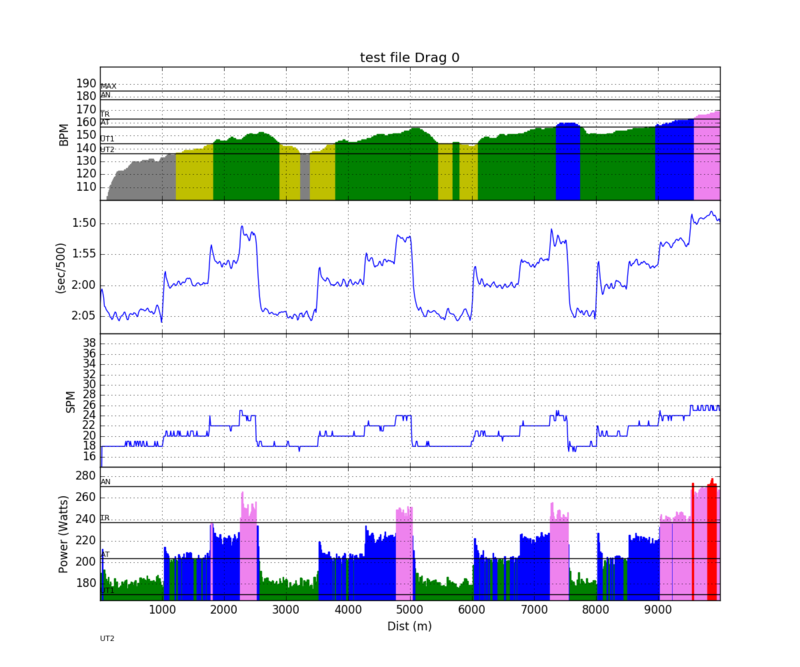 When you put your cursor over the plot, it will show you more detail about the data points. Down at the bottom of the right hand side is te text summary of the currently defined intervals. We are going to be modifying those in this example. The way to do that is to use the tiny little box on the bottom left of the screen. So hang on, this is where things get a little bit intense. 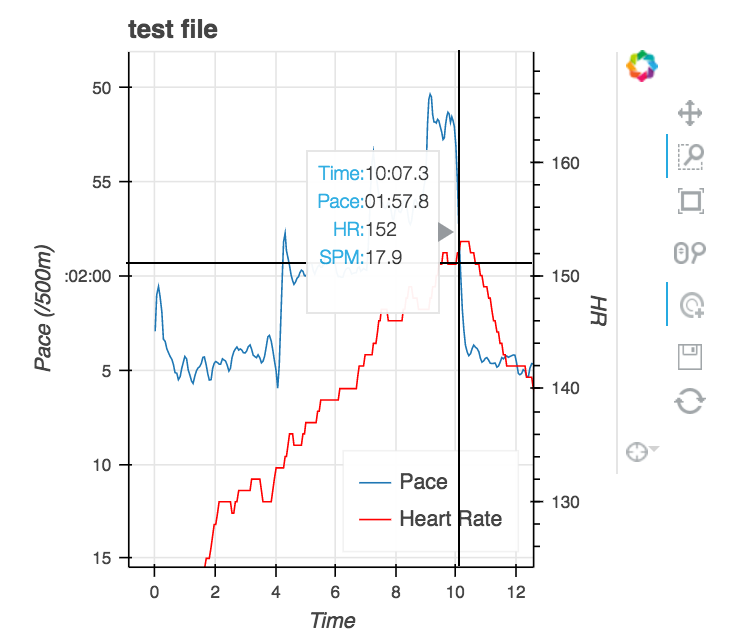 On rowsandall, Sander has developed a way to parse the shorthand notation that coaches and athletes usually use for intervals. Click the update button, and the summary section will update to look like this. See, now the total distance is 10000 meters, fixing the integer stroke data issue. 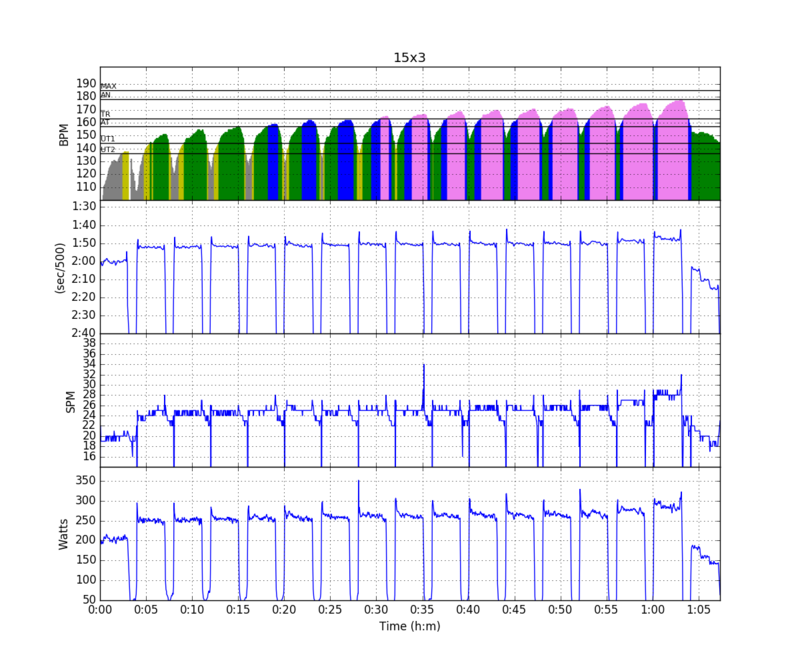 And down below, there are 4 separate summary lines for each 2500m interval. Now you can compare between sections. You can continuously redefine the workout description. In this workout, the first 3 intervals were identical rate ladders, each with a 1000m, 750m, 500m and 250m section inside them. The last 2500m section had 5 chunks of 500m each. If you want to look at each of those little sections, you can do that too with this intimidating description. See how each section has it’s own summary. Now you can compare all the 1000m sections to each other. 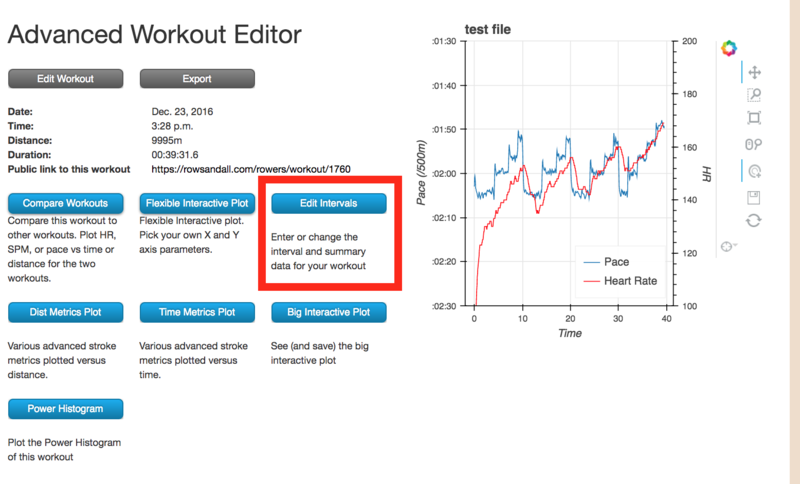 The interval editor also works for time based workouts as well. For example, here is a workout that had a 30 minute steady state section and a 10 minute cool down. I defined 6 minute splits on the PM5. All of them are a little off because of the stroke based data. But, if I go into the Interval editor and I provide the following interval definition. When I click update, I get my 20 minute row split in to five, four minute sections, and a 10 minute section for the cool down. 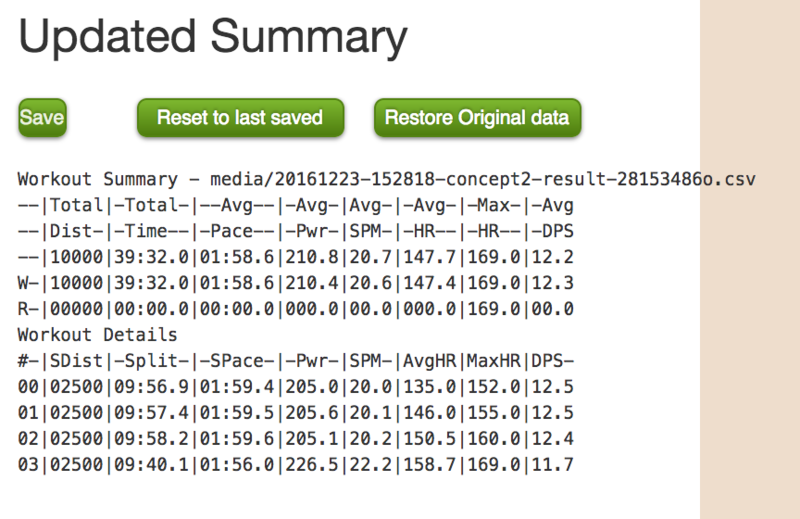 Up in the summary, there are two rows of data. One starts with “W” and the other “R”. The “W” row is the “work” summary, and the “R” is the “rest” summary. An interval based workout is usually defined by a work distance (or time) and a rest distance (or time). For example, here are the typical “Pete Plan” workouts written as the interval editor would expect them. After you do a few of these, it becomes second nature. You can also define time based intervals, like I did for this classic Wolverine plan “L3” workout, the 15×3. In this workout, I set up the PM for 3 minute work and 1 minute rest. I did the first and last intervals as warmup and cool down and I wanted to look at 15 in the middle. So, I defined the workout like this. See the 0 minute interval at the start. The Work summary shows the total time of 45 minutes (15 x 3), and the rest is 15 + 4 + 3 = 22 minutes, the 19 seconds is the left over in the last rest before I pushed menu on the PM5 to finish the workout. 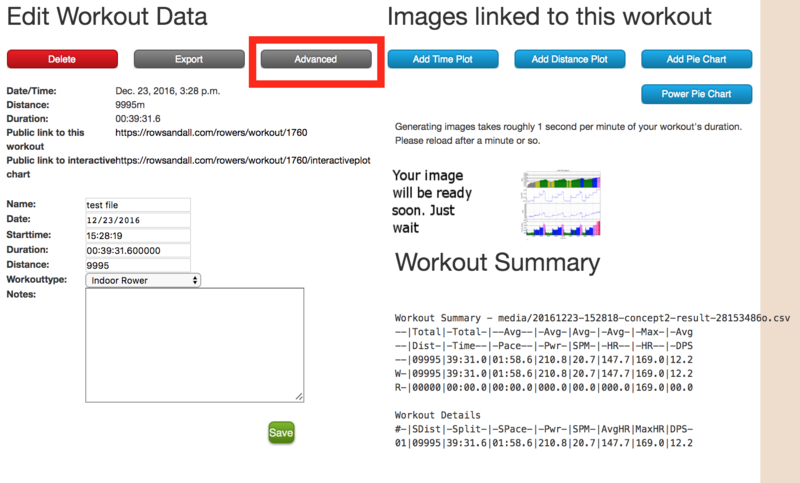 This is great because you can accurately compare the performance between similar workouts without worrying about data from the rests messing you up. Sometimes it is easier to just setup the erg for a “Just Row”. On the water, where you often have to adjust to the length of your lake or river, or adjust your workout, it can be hard to use a predefined workout from the speedcoach. The interval editor allows you to be a lot more flexible with your workout planning because you can sort out the data after you get back to the dock. Here are two examples. The first is from the erg. Before Thanksgiving, I was having a bit of fun trying to fit a variety of workouts into the exact distance of a half marathon. One extreme example was trying to do a 8x750m workout embedded in a half marathon. I planned it out ahead of time. I would do a 5000m warmup, then paddle until I got to 15750m left to go. Then I did 750 intervals and 750 rests until I finished 8 of them. Then I rowed the rest of the way as a cool down. The summary was very cool looking. Then I used the interval editor to pick out the 8 work intervals in the middle with this description. I used the little graph on the right hand side to figure out where the first interval started and then just went from there. The summary looks like this. As I described above, sometimes it’s hard to do a completely preplanned workout on the water because of the length of your river, or other boats, or conditions or whatever. I usually just record strokes and have a rough plan of what I will do in my head for the workout. For example, I did a 4 x 2700m threshold workout in the fall. I did it on my home river, which by some coincidence has about 2800m of usable distance on it. This is the overall distance summary chart. To get the intervals right for OTW stuff takes a bit more fiddling. 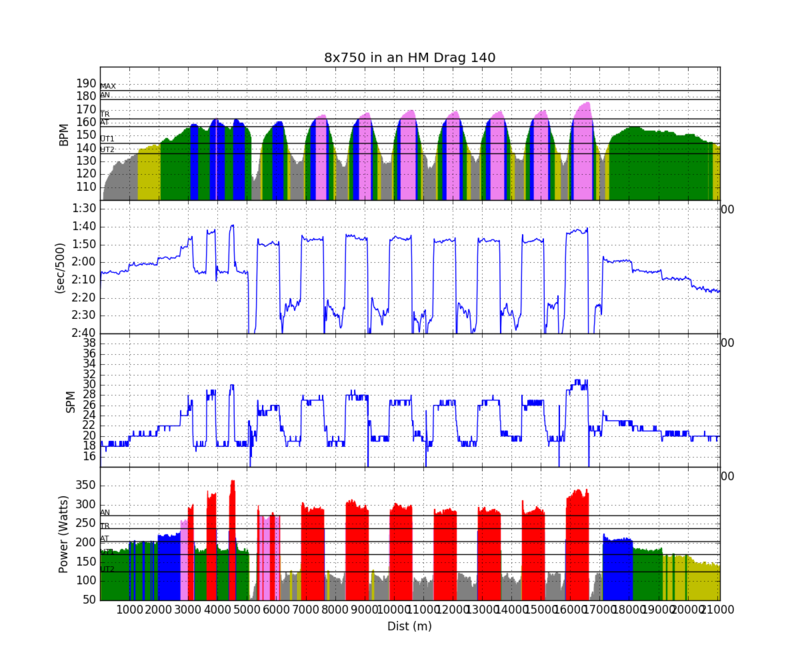 I use the flexible interactive plot to find the start point of each interval, and then adjust. For this workout, here’s the summary. 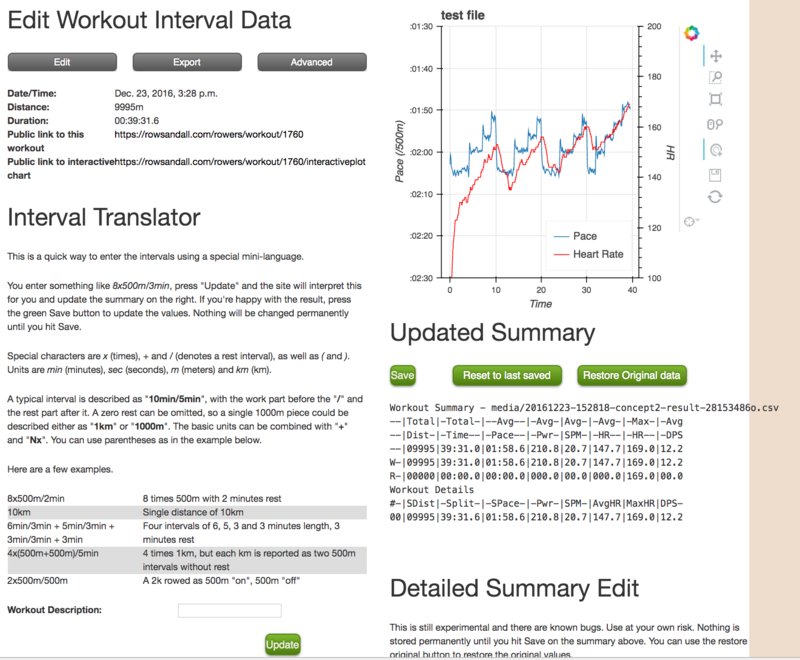 The Interval editor is one of the more powerful features on rowsandall, and especially useful if you want to track progress on the same workouts over a long season.